The US university system remains the world’s most popular destination for international students, welcoming a record of 974,926 students in the 2014/15 academic year. So, what do all these students see in US universities that motivates them enough to travel so far in order to enroll at a US college? I invite you to check out for yourself the benefits of studying in the US. It’s not a secret that many of the best universities in the world are located in the US. In fact, according to the QS World University Rankings®, half of the top 10 best universities in the world are located in the US. 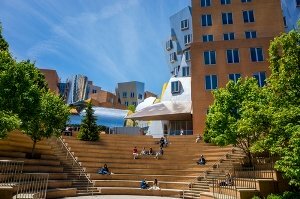 These are MIT, Harvard, Stanford, Caltech and the University of Chicago, but besides these well-known names, the US is home to hundreds of other prestigious universities and colleges. No matter in which state of the US you wish to study, you will have plenty of amazing choices to upgrade your education. The strong reputation of US universities will immediately transform you into an attractive candidate for future employers. With over 4,500 US universities offering undergraduate degrees, and opportunities to combine various subjects as ‘majors’ and ‘minors’, the US is the place you go if you want to experiment with different classes and subjects. There is no other country in the world where you can find such a diverse range of programs and flexibility. You will be able to study some of the most innovative subjects and interact with well-known scholars who will guide you during your study years. The huge number of US universities and colleges also means you have many options when it comes to choosing the kind of experience you want. Consider the university’s location, courses, accommodation, size, faculty, student body, tuition fees, sports programs, facilities and more. If you’re saying that US campus life is not the first thing that comes to your mind when thinking about studying in the US, you’re probably lying. By attending a US university, you will get the chance to experience one of the most interesting cultures, but also interact with other students from all corners of the world and become truly international. Every young student has dreamed at least once about living in the US, and the easiest way of making your dream come true is by traveling to the US for your studies. You can live on the university campus, join sports teams, clubs and fraternities or sororities, and have all the amazing experiences you’ve been dreaming about. Does this even need more explanation? The current job market requires good levels of English for most international jobs. And what better way to acquire this skill than by immersing yourself in a culture where English is the primary language? Even if you are already good at English, you will get a better understanding of the language and vocabulary by actually interacting with native speakers on a daily basis and by having to perform all of your daily activities and academic tasks in English. Don’t come to study in the US if you are not a fan of diversity, novelty and interesting lifestyles. Here, you can experience the most vibrant campus life in the whole world. Given the fact that the US is the top choice for most international students, you should expect to meet people from all corners of the world on a daily basis. Besides getting to know more cultures and interacting with interesting people, you will probably make lifelong connections and return home knowing that you’ve got new friendships that will last forever. Being aware of the fact that US universities have a great reputation and are well-known for the quality of their education, it’s not surprising that companies are excited to welcome young people with US degrees. By studying in the US, you will make the first step towards a successful international career. During your student years, you will also have the opportunity to gain experience in your field of study through the Optional Practical Training program. Studying abroad at a US university is perfect preparation for an international workplace, giving you the international experience which is sought by many employers. Studying abroad is clearly an interesting life experience altogether, but studying in a place so complex and varied as the United States is even more fascinating. Many international students say that studying in the US has helped them get out of their comfort zone, become more open-minded, and broaden their horizons. Studying in the US will be a meaningful experience that will expand your view of the world and of your own life. You will not only grow professionally, but also personally. If that isn’t convincing enough for you, just think about the fact that you will be able to travel to numerous states in the US a lot more easily when you actually live in one. After going through all these benefits, it is little wonder that so many students are choosing to study in the US. It will continue to be the top educational destination for international students and should be seriously considered by every applicant who is considering studying abroad. If you are one of them, I strongly recommend that you sign up for the QS #StudyinUSA Virtual Fair, to find out more about studying in the United States. Manuela is passionate about education and evolution and wishes to collect enough information in order to help students from all corners of the world take the big step towards their incredible future. I am really so happy if selected to study in USA .